AQUAMANTRA, the award-winning bottled water company, will be saying a new "Mantra" this holiday season. "I AM GRATEFUL" is more than words, it is the name of the latest innovation coming from the AQUAMANTRA Premium Natural Spring Water company. The vibrant 1 liter bottle of "I AM GRATEFUL" is unveiling exclusively in the U.S. in the Southern Pacific Region of Whole Foods Market beginning November 1st. Marci Frumkin, Marketing Director, Whole Foods Market, Southern Pacific Region said, "Whole Foods Market is excited to support this newest addition to the AQUAMANTRA family of unique and life sustaining water." Alexandra Teklak, the young founder and CEO of AQUAMANTRA, brings a unique energy and mission to the company. "'I AM GRATEFUL' continues our promise to deliver innovative products exclusively for our retail partners. We're thrilled to introduce our 4th mantra which is highly complementary to the Whole Foods Market's business mission. AQUAMANTRA's goal is to be a champion for the earth, sustainability and that all people everywhere have access to clean drinking water," says Teklak. Gratitude unlocks the fullness of our lives; it can turn food into a feast, a house into a home and an outsider into a friend. Ultimately we believe the brand's highest calling is to change the world one sip at a time," says Jacqueline Rubasky, AQUAMANTRA's Strategic Brand Advisor. "The launch of I AM GRATEFUL coincides with Thanksgiving which is a holiday where gratitude is on consumers' minds. We hope to encourage them to continue celebrating the abundance of life, especially during these economic times. At the heart of AQUAMANTRA is an authentic awakening, one that resonates with consumers' souls," explains Teklak. "At no other time in our history, has the planet needed inspiration more. Our consumer research tells us that people want to make a difference. Our water helps to connect with the consumers' need for expression in this area and makes it a reality, leaving them truly satisfied at the deepest of levels." Each bottle of AQUAMANTRA, inspired by affirmations has a work of art which glistens through the crystal clear water bottle. I AM GRATEFUL's artwork beautifully showcases a pink lotus flower overflowing with water, before it forms a teardrop which contains the planet and descends into the open arms of a woman figure which symbolizes our humanity. This original artwork was painted by nationally re-known California artist Dan Johnson, (http://www.danjohnsonartist.com), to convey the human aspect of gratitude for our planet, in all its beauty and wonder. "The genius of AQUAMANTRA is to embrace a thought while taking into our bodies the most beneficial liquid people can consume and my job was to capture that through my brush," says Johnson. AQUAMANTRA's purification standards exceed those of most bottled and municipal waters, making it valuable for those who wish to maintain optimum health, specifically people who are challenged with immune difficulties. The source of AQUAMANTRA's exquisite taste is San Diego's Palomar Mountain, known for its abundant springs, rich silica levels and perfectly balanced pH of 7.4. The prestigious Berkeley Springs International Water Tasting competition awarded AQUAMANTRA with 'The Best Tasting Bottled Water Gold Medal' in 2007. 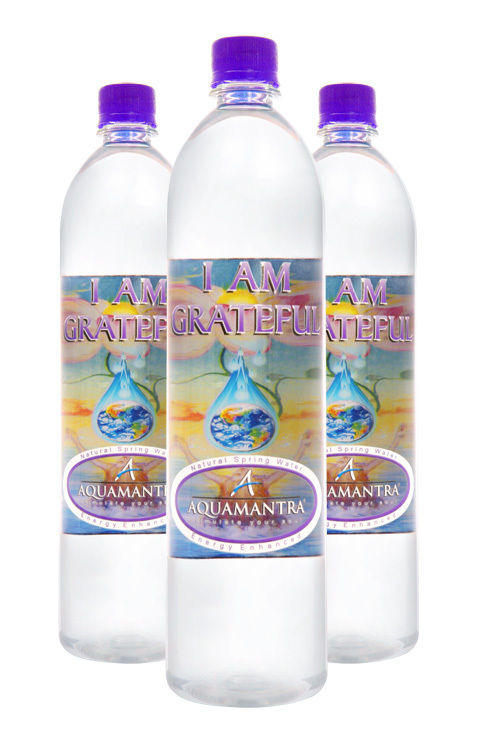 "I AM GRATEFUL" joins the full line of premium waters from AQUAMANTRA including, "I AM HEALTHY, I AM LOVED AND I AM LUCKY", available in Whole Foods and other fine purveyors of foods and optimum nutritional products. A percentage of profits from the sale of "I AM GRATEFUL" will be going to a charity dedicated to bringing clean water to communities in Africa, the charity can be found on our website. AQUAMANTRA is the first water to offer consumers a premium hydrating beverage and an experience that enlivens, enriches and deepens the consumers' relationship with themselves and the world around them. With all the beverage choices today, our LOHAS brand has a level of authenticity and transparency that is rare to find. AQUAMANTRA invites you to visit us at http://www.aquamantra.com to learn more about our products, affirmations, quantum physics, the law of attraction, our charities and more.